When I visited Barcelona, it was for the purpose of seeing La Sagrada Familia and other works from the great Catalan architect, Antoni Gaudí. Apparently Barcelona has fine shopping, a beach, and a soccer team. But I was there for Gaudí. Soon after returning home, I uploaded a few pictures of La Sagrada Familia with some commentary, which was two years ago. I saw Hensbergen’s biography of Gaudí in the book shop at Casa Milà. With limited space in my luggage, I decided to order it once I got back to North Carolina. It remained on my always extensive books-to-read-soon shelf, so I have only now read it. I enjoyed it from beginning to end. Gaudí wrote very little. The quote at the top of this post — which is given twice in the book (138, 233) — is one of the few citations from Gaudí’s pen. Thus, the biographer is reliant upon the personal relations, the historical context, etc., and, in Gaudí’s case, the art itself — what it says of the artist. Hensbergen does all of this well, scholarly while writing with a decently broad readership in mind. Thus, architectural jargon is kept to a minimum. However, it can be a difficult book to follow if you have never visited Barcelona and are unfamiliar with Gaudí’s major works. If you are a spatial thinker, it helps tremendously to have the layout of the city in mind, such as where Park Güell is located or the Gothic Quarter, Tibidabo, etc., or the pilgrimage site of Montserrat outside the city. Since I have been to all these places, I could navigate the book with much greater ease. In lieu of travel, you could use Google Maps. And while there are some color photographs in the book, you will likely want to look-up each building under discussion. The historical forces in Barcelona in the latter half of the nineteenth century were moving throughout nearly all of Europe’s major cities. The social disorder in the wake of industrialization was coupled with a yearning, from many, for tradition and stability, mystery and awe. Romanticism and the Catholic revival spoke to the young, passionate, energetic mind of Gaudí, who was also a political liberal in his younger days (71-73). Hensbergen locates Gaudí within this broader movement against rational reduction, materialism, consumerism, and such things. “Materialism had become a brutalizing force in society. Aestheticism offered an escape from the unrelenting industrial grind” (72). Hensbergen later repeats the same point while pointing to a certain paradox: “The reality Gaudí was escaping was the dread world of materialism. Yet at the same time he had been working most of his life for Catalonia’s leading industrialists” (189). And this points to at least one likely reason why Gaudí moved in a more conservative direction as his career began, embracing Catalan nationalism, albeit in a more moderate vein and without any naivety about the Church’s faults (see, for example, the anecdote on p. 205). Gaudí’s life was made possible by patronage, most notably that of Eusebi Güell, and so the artist’s craft is made possible by the elite — and this is especially true for the architect’s work which requires a steady monetary flow and reliable labor force. But the greatest inspiration in Gaudí’s life was his Catholic faith, which had matured from that of a youthful aesthete to the sober piety that marked nearly all of his adult life. He attended mass every Sunday at the cathedral and daily confession at the church of Saint Philip Neri (Sant Felip Neri), both in the Gothic Quarter (162). By the time of his final years, working exclusively on La Sagrada Familia, his routine was set with daily mass in the morning and confession after his workday was complete (257). The most prominent testimony to his Catholic faith is the work itself. Hensbergen notes the Christian imagery throughout the book, such as the importance of mountains for Catalan Catholic faith in particular (185-186). Hensbergen is not a theologian and tends to keep such matters fairly brief in comparison to the detailed discussion of his personal relations. Thus some readers (the sort who read this blog) will desire even more discussion on the religious evocations in Gaudí’s work. I would have loved to read more about the importance of sacrifice in Gaudí’s life and faith and how this is manifest in his art, but Hensbergen does highlight it at different points in the book (pp. 141 and 151 for example). The important thing is that the reader is not left with any doubt about Gaudí’s work as an expression of his Christian faith and religious discipline, not some vague spiritual inspiration. That’s probably not going to convince everyone, but I actually think there’s something to it. I won’t elaborate. Hensbergen fills the book with interesting bits like this. By all appearances, it is a well-researched book, and it is — as far as I know- the only biography of Gaudí in English so far, even though there are several books that feature and discuss his works. So, I recommend it for anyone with a love for Gaudí. 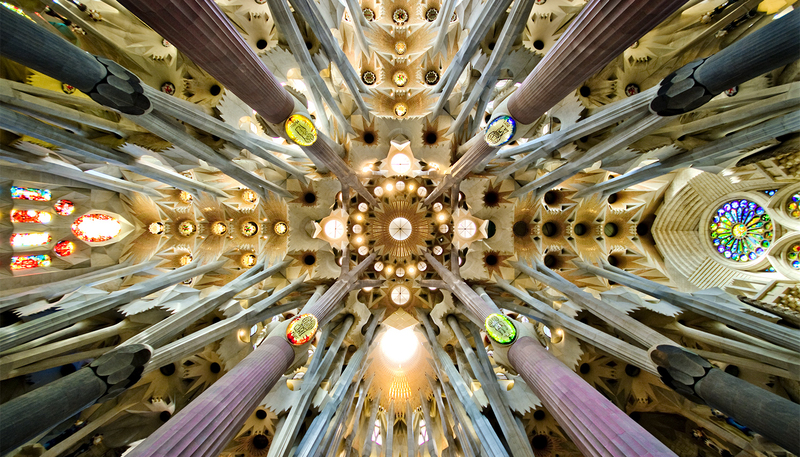 And if you have not watched it yet, be sure to check out the CBS News feature on Gaudí. You can watch it below, and you’ll notice that Gijs van Hensbergen is interviewed. Note: The image above, in the middle of the text, is La Sagrada Familia’s nave ceiling and is from wikipedia commons. The quote from Gaudí is from p. 250 in Hensbergen’s biography. I’m sure I speak for many others when I say I’m dearly missing your blogging, Kevin. Thank you, Ian. We’ll see if I have the time and energy to get back at it.